These are the horizontal polars. I'm running the horn flipped 90 degrees, so these polars will be different than what you see from other users. (Will be the same as their verticals.) In the graphs we see that the midrange is quite low, but this is due to the fact that I only have one midrange on the horn, not four. Once I add three more the level will rise by about six decibels. 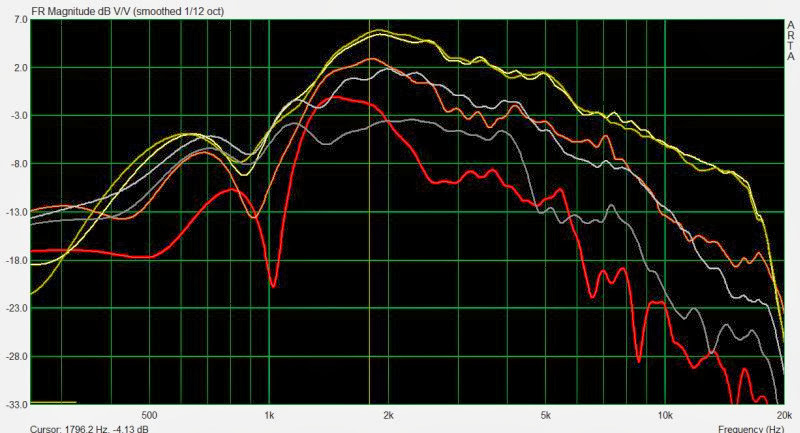 There's also an off-axis dip due to it being a dipole, and that peak is higher in frequency than the last horn because this horn is smaller. Here's the vertical polars. Same setup as the last graph, which is one compression driver and one midrange mounted on the horn. The dipole dip is a little bit lower in frequency because the horn is taller than it is wide. Here's where things get interesting. As I've noted on some other threads, I really like the sound of PK Sound cardioid subs, and the Gradient Helsinki cardioid. And I think that my Synergy horn will be cardioid-ish, not dipole or monopole. In the graph above, I have reduced the output of the midranges. I did this with a very sophisticated device. 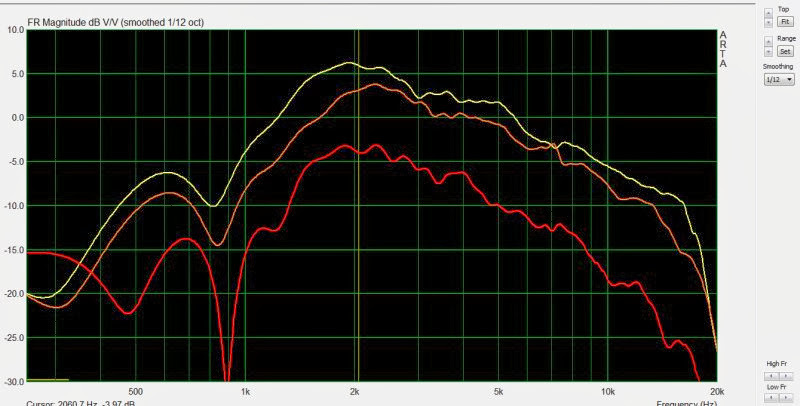 1) The cardioid-ish response is much smoother in the high frequencies. I believe this is because the scarf is reducing the output from the midranges, so that it doesn't interfere with the compression driver. The reason that we have to do this is because the front of the midranges is filtered by the coupling chamber and the horn, but the output radiating from the rear of the cones is unrestricted. And due to that, as you move off axis on the dipole, you get ripples in the response. Going cardioid cleans that up, as you can see in the off axis response particularly at 45 degrees. 3) On the downside, going cardioid-ish reduces the low frequency output level. (Because there are frequencies where the front and back combine constructively.) But this isn't a big deal, because we have tons of midrange output once we put four midranges on the horn. Here's the cardioid-ish response by itself, and on the same graph as the dipole for comparison's sake. I had some excellent results with a cardioid-ish type speaker recently, so I decided to resurrect this *other* project that's been gathering dust in my garage. 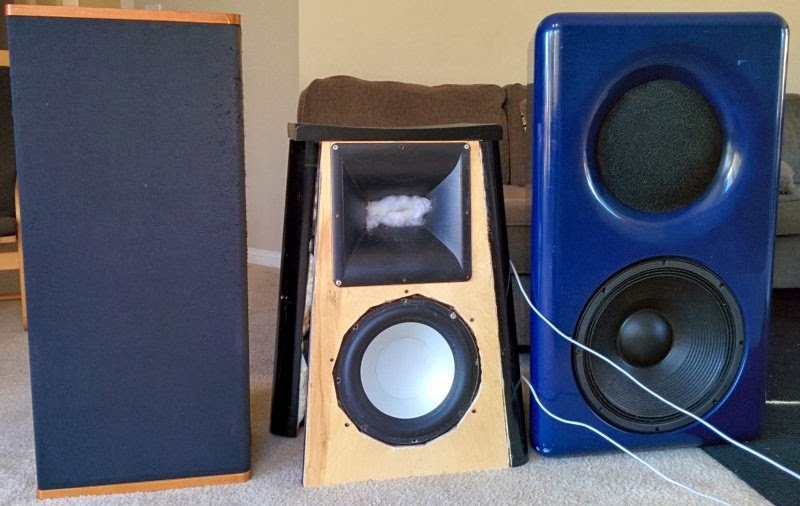 If anyone wants to follow the progress, the post above details the speaker project named "Monster Massive", which is basically a Synergy horn midrange and tweeter, combined with a U-Frame woofer section. The use of a U-Frame raises the F3, but makes the speaker more directional. I'll post some pics and measurements tonight. That's the speaker that I finished this month. A polar response measurement of the tweeter on the waveguide (0, 22.5, 45degrees), with a simple first order low pass to offset the rolloff introduced by the CD waveguide. Nice. 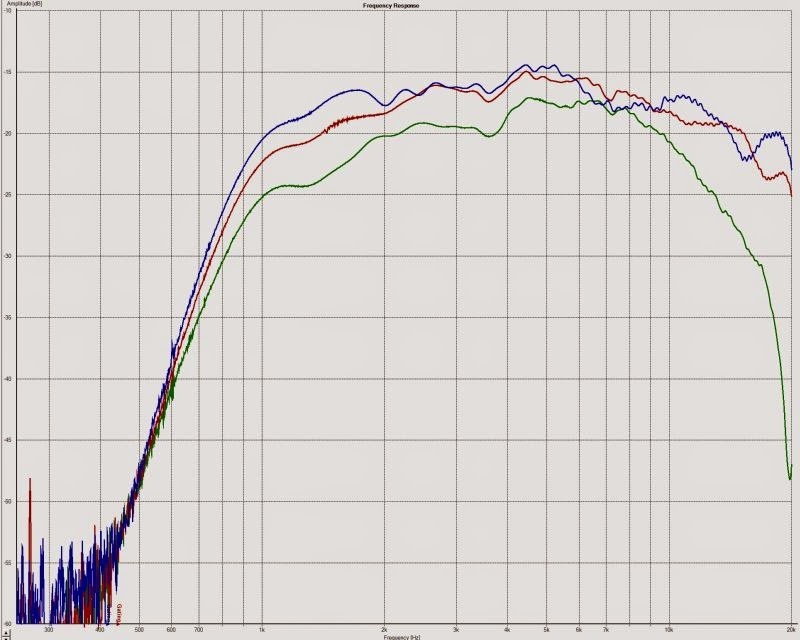 What frequency are you planning on running the woofers down to? John K uses a baffle width of about six inches. That width sets his crossover point to something like 1khz, due to the dipole peak. Something I realized from my last project (LX Mini Homage, 2nd Try) was that you need to keep the width of that baffle narrow. So the baffle width will likely set the crossover point. Hopefully I can get it down to something like 1khz. It's hard to predict right now, because the radiation is complex. "The Edge" can sim a baffle, but I am not aware of anything that can easily sim a dipole waveguide. I don't think that you wil get real dipole 8 directivity pattern from the horn mids, it is so asymmetric. But anyway backside radiation will be present and it can be heard and measured in room decay. The 12 will likely be beaming as a dipole at 1khz. Back when I had my dipoles I used an 8" lower mid and it would only maintain directivity to 1khz. Hi Patrick, I didn't find your thread about waveguides and lenses - so here is a picture of the new Audi A6 with Beolab 5 style lenses on the dashboard! @ Patrick : like all your "detournement" designs , huge and great DIY spirit ! I can write it as it was Thanksgiving yesterday ! Last edited by Eldam; 27th November 2014 at 12:21 PM. Reason: pbs of time alignement with my computer board ! Here's some more measurements of a woofer with a coupling chamber in front of it. This type of arrangement is handy if you're trying to cram the output of a 12" woofer through a 6" hole. 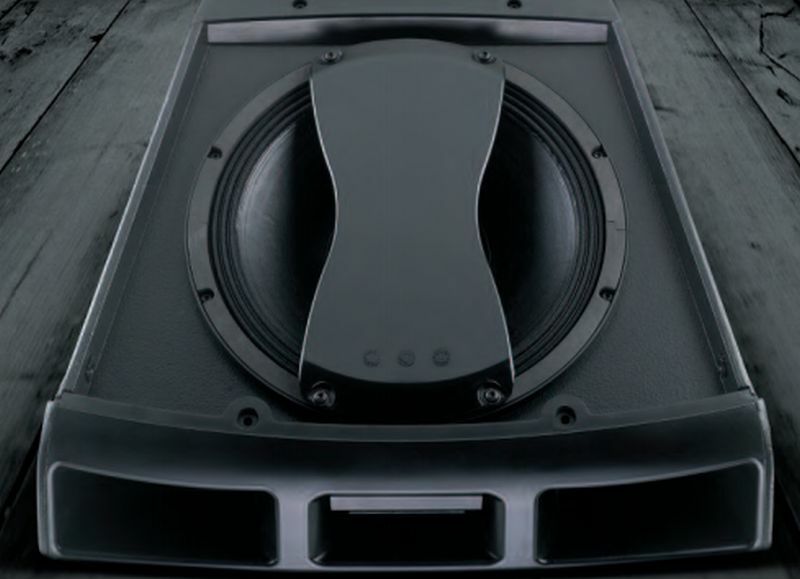 For instance, if you have a 12" woofer in you're trunk, and you're hanging the woofer off of the rear deck and firing through the stock speaker hole. In the world of horns we call this a "coupling chamber." But you can use a coupling chamber with anything. A sealed box, a vented box, etc. Basically the coupling chamber acts like an inductor, it rolls off the highs. The cool thing is that it's way WAY cheaper than an inductor, it reduces harmonic distortion, and it allows you to squeeze a lot of output through a small gap. 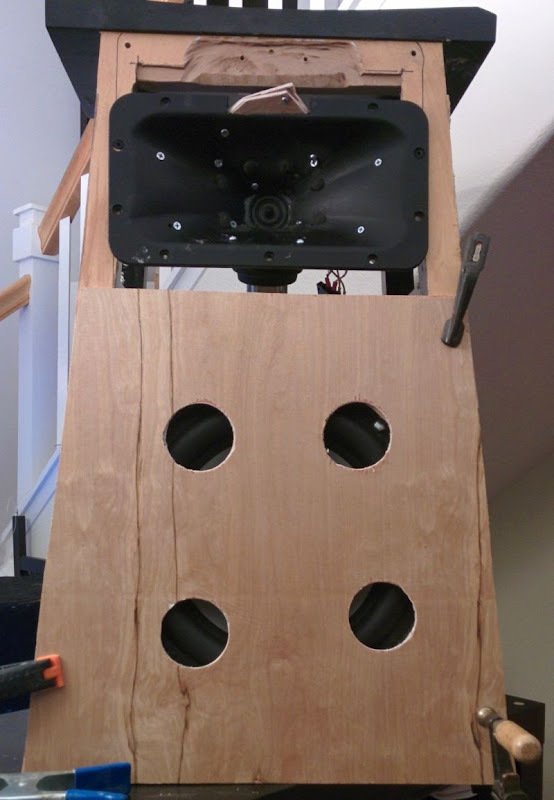 First off, here's a pic of what the speaker looked like before I added a coupling chamber. It's the speaker in the center, sporting a Diyma12, flanked by my Vandersteens and my Summas. This is similar to what the prosound company "Nexo" uses in their loudspeaker arrays. Here's the measured response. I did this in my living room, so there's going to be some reflections in the mix. IE, response won't be as smooth as you'd get with an outdoors measurement. The red line is the DIYMA12 response with no coupling chamber. Green line is with the coupling chamber. The blue line is with the coupling chamber, and some fiberglass insulation inside the chamber. 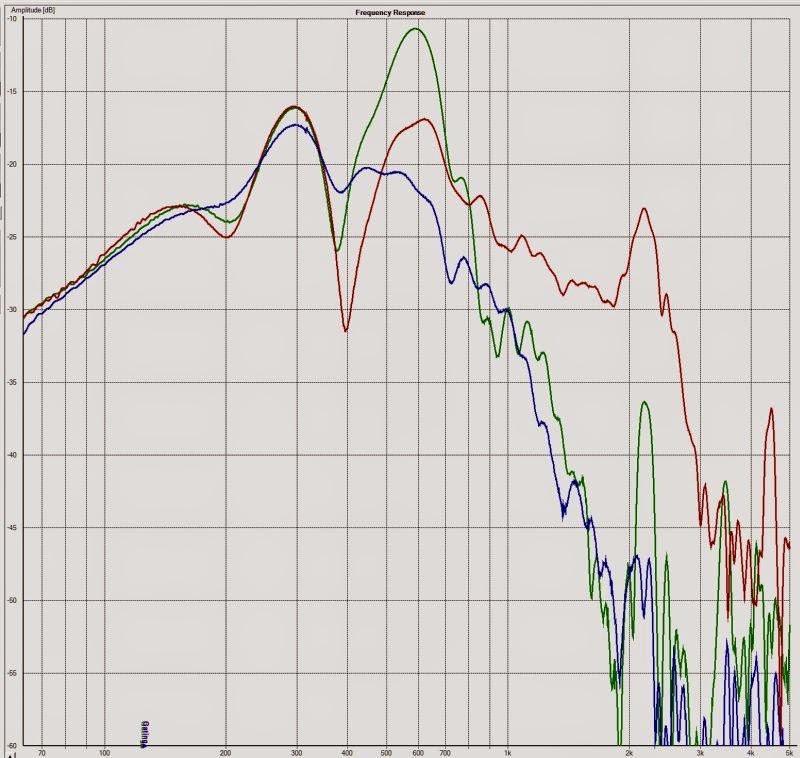 1) The response of the DIYMA12 without a coupling chamber has a hell of a dip at 400hz. That dip limits it's usable upper limit to about 200hz, despite the fact that it has output out to 2khz. The dip is likely due to resonance in the cone or in the inverted dustcap. Basically, the cone is ringing. 2) The coupling chamber fills in the dip and rolls off the highs. 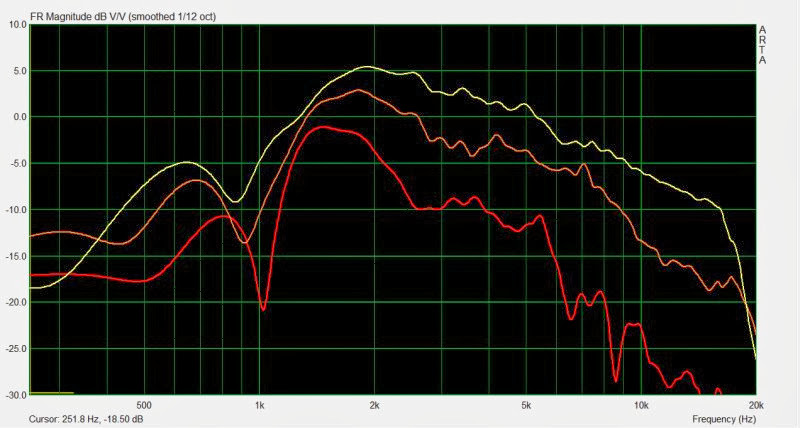 But it also exaggerates the output at 600hz, by six dB. 3) The best solution, in this scenario, is to shove some fiberglass insulation into the coupling chamber. We lose a tiny bit of low frequency efficiency, about one decibel. But we smooth out the response in a HUGE way now. I have an inductor in series with the Diyma in these measurements. If you tweaked the size of the inductor, and adjusted the fiberglass batting a bit, you could probably run the Diyma12 all the way to 1khz! And THAT is why low inductance subwoofers rule!